The race to replace Gov. 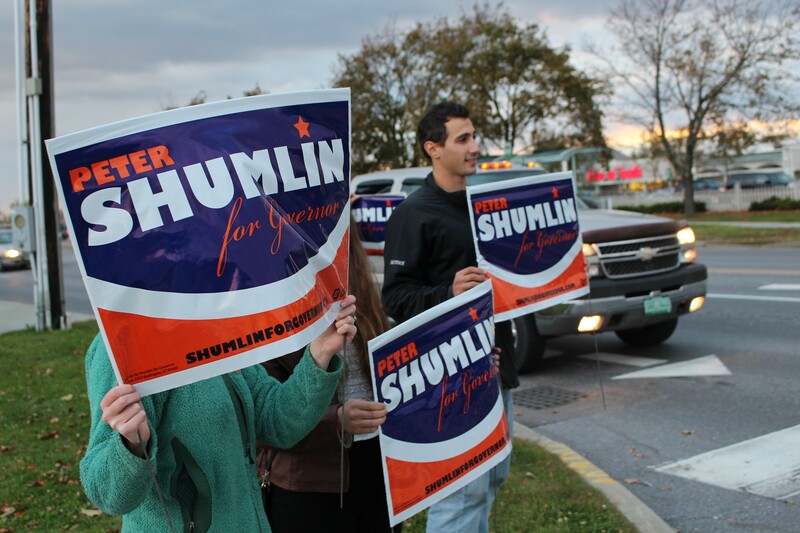 Peter Shumlin is taking candidates downtown. A theme is developing here: Vermont's Democratic gubernatorial candidates are opting to kick off their campaigns in downtown locations that serve as backdrops to their salient points. Two of those campaign launches are coming next week. Three Democrats and two Republicans have announced plans to run for the open governor's seat, after three-term Democrat Peter Shumlin announced in June he would not run again. Democrat Shap Smith was the first to hold a formal campaign kickoff. His was in August in downtown Morrisville, his hometown, which is also in the midst of revitalization efforts. Matt Dunne, a former Democratic state senator, will hold his kickoff in City Hall Park in downtown Barre at noon Monday. Barre is a ways from Dunne’s hometown of Hartland, but is centrally located and just happens to be the hometown of Republican candidate Phil Scott. Dunne will make the point that Barre is “an inspiring place to look at for Vermont’s future,” said campaign manager Nick Charyk. “It’s a downtown that struggled over the years and is actually doing quite well,” Charyk said. Sue Minter, a former Democratic state representative and transportation secretary, will hold her campaign kickoff at 4:30 p.m. Tuesday at the train station in heart of her hometown of Waterbury. “It reflects a gem of our downtown revitalization in Waterbury,” Minter said. Minter plans to highlight her involvement in the community, including the 2006 project to renovate the train station and her work as the state’s recovery officer following Tropical Storm Irene, which hit Waterbury hard in 2011. Former governor Madeleine Kunin and former state senator and lieutenant governor Doug Racine are scheduled to speak in support of Minter. Republican candidates for governor— Scott and retired Wall Street executive Bruce Lisman—have not indicated whether they will also go downtown to kick off their campaigns. Scott said his campaign will launch in late November or early December. Lisman’s will be “a couple weeks from now or so,” said Shawn Shouldice, a Montpelier lobbyist who has been working with Lisman’s campaign.